Amy's Creative Pursuits: A Romantic Savanna Maxi Dress and a Link Up! 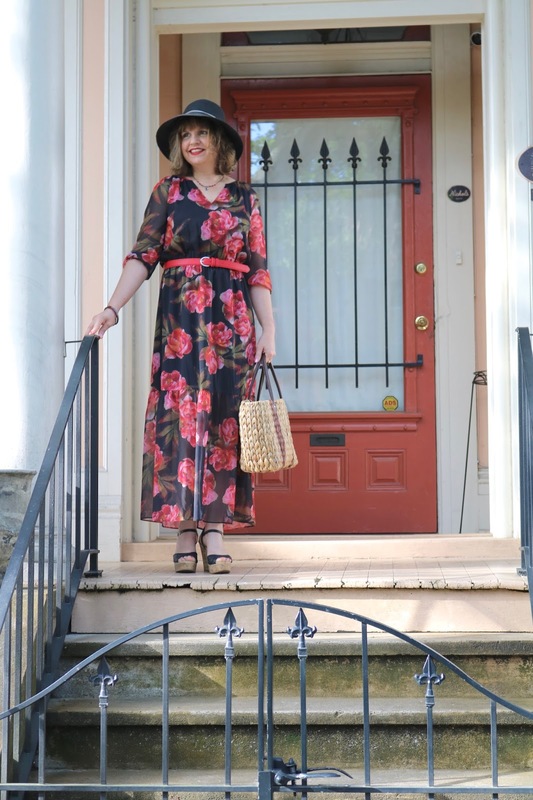 I'm so excited for today's fashion post because I not only get to show you this gorgeous floral maxi dress I wore in Savannah and for Mother's Day, but I am also co-hosting with Cheryl from Northwest Mountain Living & Style! This is the first maxi dress I have ever purchased. I've tried maxi skirts before, but I never liked them on me. I did not think they looked good because they covered up the thinnest part of my body (my legs) and they chopped me in half making me appear shorter and wider. Maxi dresses do just the opposite, they elongate the figure because it's all one piece; you actually look taller in them! As for covering up my legs, this dress has a sheer bottom so you can still see my legs! Win, win! 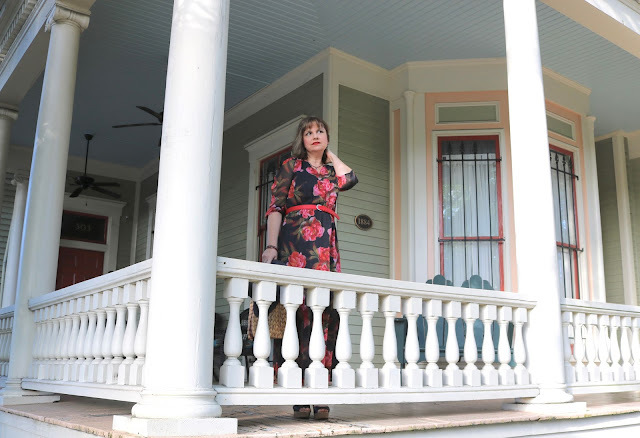 All these pictures were taken at the gorgeous home we rented in Savannah. Be sure to check Wednesdays Travel Post for a tour of the interior. I felt this dress fit the Savannah "mood" quite well, don't you think? I purchased this dress for an absolute steal from JCPenney. It was on a clearance rack in March! I actually bought two maxi dresses that same day and I wore the other one in Savannah as well. That one also shows my legs! Who knew I could find maxi dresses that showed my legs. Anyway, by the time I used my JCP coupons I think I paid $14.99 for one dress and around $7.00 for the other. What a steal eh? In this photo you can see my legs through the sheer fabric. It's much more noticeable in real life. 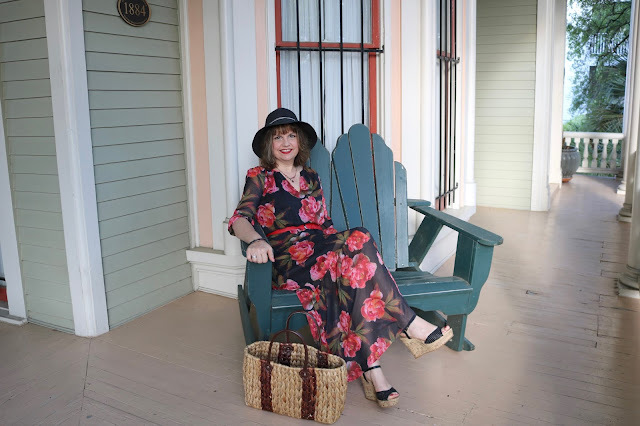 I paired my maxi dress with black sandals, a black straw hat, and a straw bag (all old). 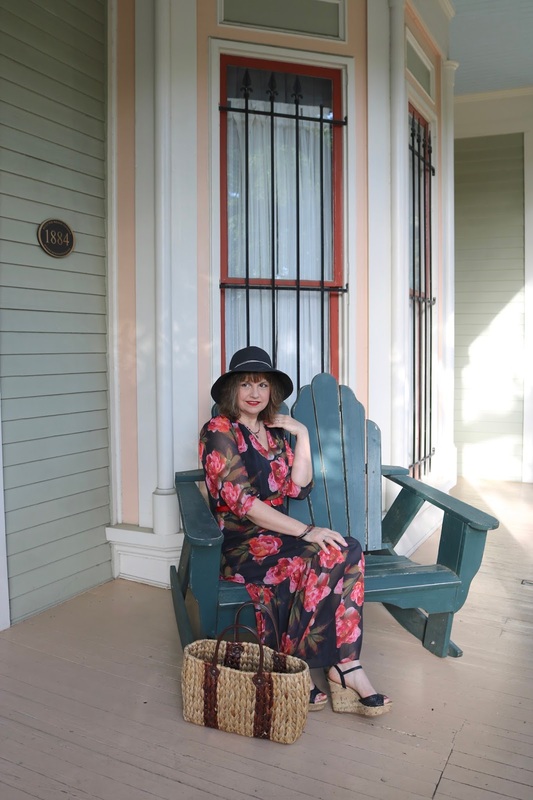 I wore this hat and carried this bag all week long, but no, I did not walk around Savannah in these shoes. Yikes! I wore flats or sneakers most of the week. These are for photography purposes only. I did wear these shoes with this dress on Mother's Day though. A lot less walking that day! For jewelry I wore a red necklace, and red bracelets. I added a red belt around my waist. I'm so excited that I decided to give maxi dresses a try. They are so pretty, feminine, yet comfortable as well. I wore my maxi dresses all day walking around Savannah and I was very cool and comfortable. And now, for the Link Up! Here is what the lovely Cheryl is wearing this week. I just love her! She always has such a beautiful smile on her face and just radiates joy. She has a great sense of style too! I love her looks! 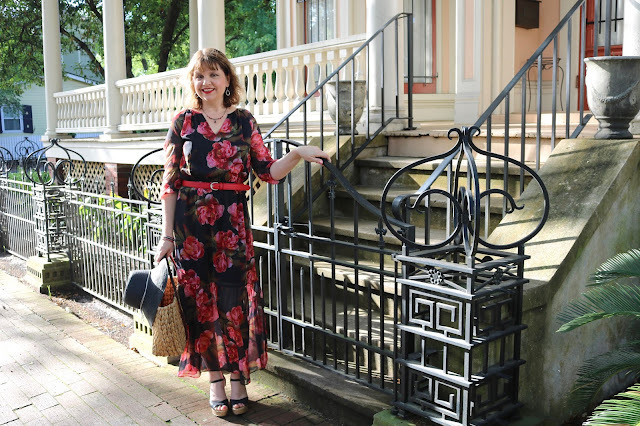 I have always struggled finding over-fifty fashion bloggers who wear clothes I would like to wear too...Cheryl is one of the few who looks I would definitely re-create for myself. Be sure to check out her blog and follow her on all her social media links. If you'd like to follow me, you can find all of my social media links on my Contact Page. 1. Follow to stay connected! 2. Add our button above or a link somewhere on your site or post. You can copy the following text and link and use it if you want. (Linking up with Northwest Mountain Living & Style here.) This way other bloggers can join the party! 3. Have fun Blog Hopping around all the blogs that have linked up, finding new posts to read, and new blogs to support! Every Friday morning until the next Thursday night, bloggers will be able to submit their favorite posts by clicking the blue Inlinkz button at the bottom of that day's post. You can add a blog link or an Instagram link. Adding your links will allow you to show off your hard work, make new connections, and gain new followers! This dress is gorgeous on you Amy! I love the roses and colors and that hat is so cute! You styled the whole look perfectly! Thanks! I did! Now I own 3 maxi dresses! So pretty, Amy, and a perfect outfit to celebrate mother's day. 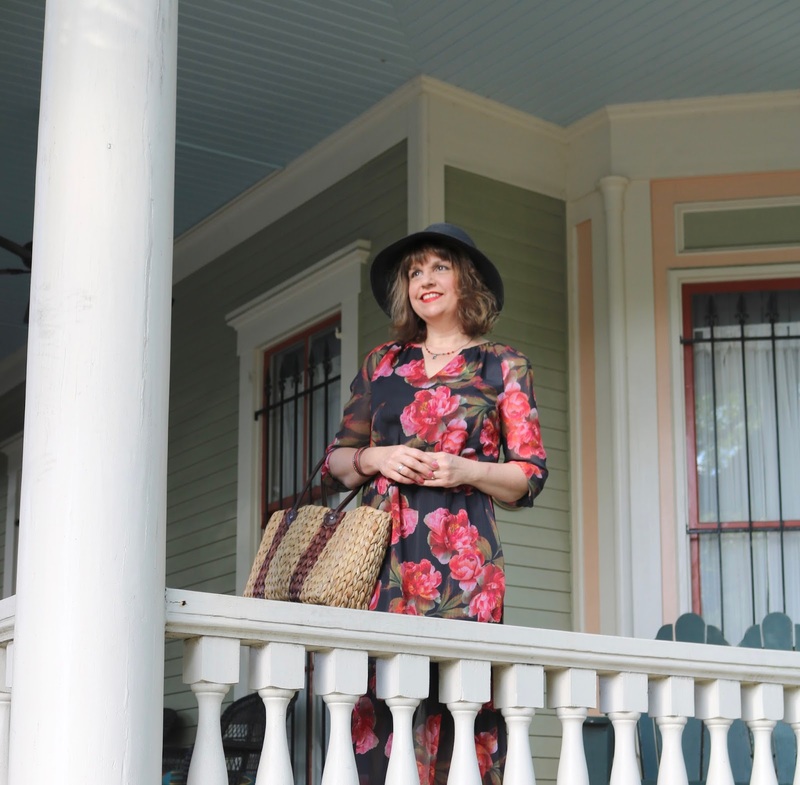 What a stylish look with the hat, and the look is a great fit with the architecture and period of that amazing house. Looking forward to a nose inside your Savannah mansion next post! Thanks for linking up with the beautiful Cheryl. Hugs, x. Thanks so much! I thought it was the perfect Savannah dress! Gorgeous maxi Amy, it looks amazing on you! Such beautiful photos too! 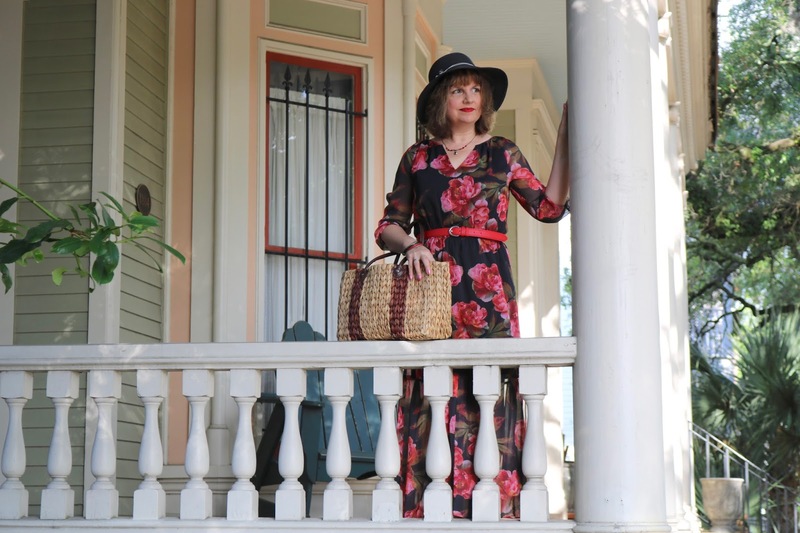 Yes, that dress (especially with the hat) channels Savannah. And at a steal - well done, you! I like comfortable clothes that look good too, and you nailed it. The red belt is a good touch as well. Have a terrific weekend! Beautiful look Amy and so perfect with the pretty setting in Georgia. I have a couple of maxi dresses in my closet but I don't get much wear out of them. Thanks Ellie! I think that was one of my fears of maxi's too...that I wouldn't wear them much. We will see how often I wear mine. I sooo love the floral dress dear, really lovely details. Even lovelier with the hat! 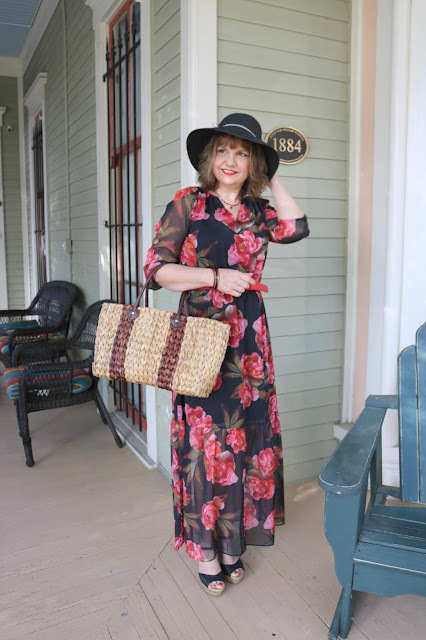 I've become a maxi convert too, Amy!! They are just such a fabulous piece for almost any occasion!! Good to know I'm not the only one. I so agree! That dress is so cute! I love the black wedges with it too! I need a pair like that! Thanks! They were one of those late summer items I picked up at JCP on clearance for just a few dollars. I can't wear them that often because of the height, but for only for a few dollars, who cares? Beautiful dress! 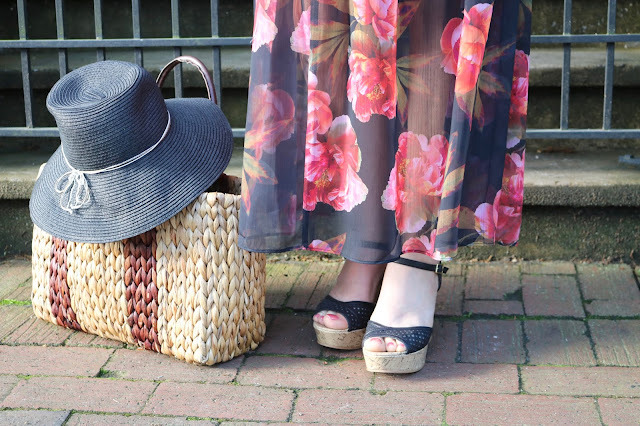 I love the boho vibe you created with the hat and wedge shoes. Thanks for linking up! Amy, I love this print on you! The maxi is beautiufl and perfect in sunny Savannah. My hubby and I love going there, as it isnt far for us and we enjoy it very much. Love your hat and bag too! Thanks Jess! You're so lucky to live close to Savannah! Awww, thanks so much! You're so sweet! So, the color scheme of this dress is fantastic and you picked a great backdrop for these photos! Thanks for linking this post up with me last week Amy!